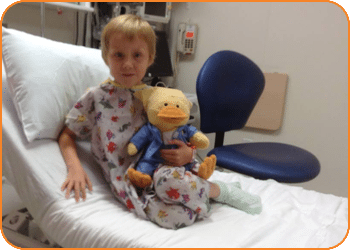 When first-grader Olivia Rueter underwent surgery to remove her right kidney, she was holding tight to her Chemo Duck. When the Illinois six-year-old became cancer-free, she was admitted to St. Louis Children’s Hospital to have her port removed. 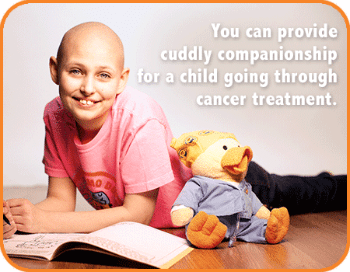 “Ducky” came with her, but not just for support: she insisted he have his port removed, too. “He received his own special hospital bracelet,” says Olivia’s mom, Belinda. The surgeon who performed Olivia’s surgery was adamant that she would also perform the port removal – for both Olivia and Ducky. “She wanted to make sure they were done correctly and with just little scars,” says Belinda. Ducky landed in Olivia’s arms thanks to a pink and white quilt made by fellow Illinois resident Nita Motogawa, who raffled her creation off in order to buy 17 Chemo Ducks for local children, including patients at St. John’s Hospital in Springfield. Motogawa lost a young niece, as well as her mother and sister, to cancer. She’s making another quilt for a second raffle so she can use the proceeds to buy additional Chemo Duck. For a recent show-and-tell at school, Olivia, now 7, brought her cuddly friend and co-patient, as well as before and after photos of the two of them together. 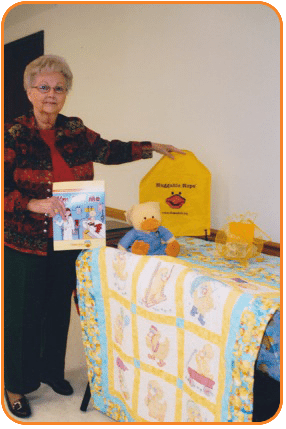 So the 76-year-old, an avid quilter who serves on a county board with a family issues focus, decided to sew and then raffle off a quilt to help buy 17 Chemo Ducks for local kids. “I’m overjoyed that I can help a family through such a time,” she says. “I wish we could have gotten one for my little niece.” Motogawa has already completed a second quilt for a second Chemo Duck fundraiser. “It’s something to make some little people happier,” she says. If anyone would like to hold a similar fundraiser and learn how she organized the raffle, Motogawa is happy to help. Call her for details at 217-868-2943 or learn more online.